Due to its P.T.F.E. covering, the IRT gasket is virtually immune to chemical attack. Ideal for use where asbestos may be prohibited by health or safety considerations. P.T.F.E. is moulded around and through the perforated stainless steel. This restricts cold flow and provides a positive seal that stays put over extreme temperature ranges and high pressures. The unique, rugged construction of the IRT gasket allows it to be reused over and over again. Unlike conventional gasket materials, it does not corrode during use and is not destroyed when the flange is taken apart, reducing inventory and sealing costs. 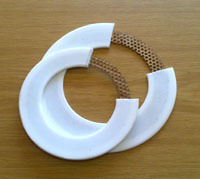 Because it is individually moulded, each IRT gasket provides you with a denser layer of P.T.F.E. 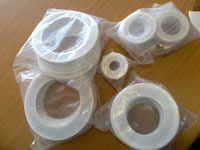 gaskets from 1/2 – 12 inches provide a 50% thicker layer of P.T.F.E. when compared to envelope gaskets, sizes from 14 -24 inches provide a 150% thicker layer. The stainless steel insert prevents blowouts that can occur when non-metallic gaskets are used. Ends costly P.T.F.E. scrap. Saves you time and money by eliminating the need to individually cut gaskets. IRT gasket provides leak free seals with low bolt torques. Specially machined flange faces are not required. With IRT gasket, repeated retorquing is not required to maintain a seal. Due to cold flow other P.T.F.E. 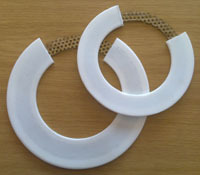 gaskets must be retorqued several times to prevent leakage. IRT gasket will stay in place, even at elevated tempertures and pressures, due to its stainless steel insert. By stocking the IRT gasket for all your corrosive applications, you can eliminate the need to keep a wide variety of gaskets in different materials on hand.